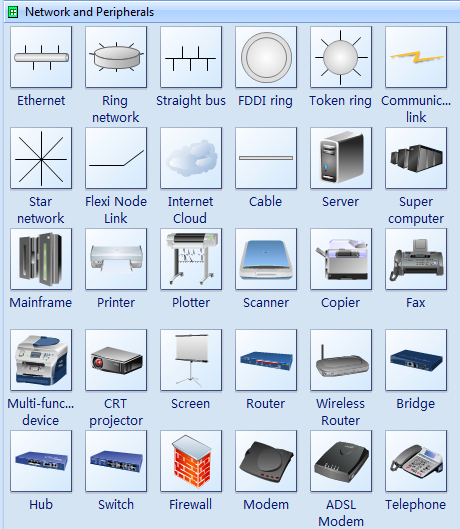 Pre-drawn network symbols representing computers, routers, switches plus smart connectors facilitate drawing network topologies, creating accurate network diagrams and documentation to be used in your network project. Computer network diagram is a schematic depicting the nodes and connections amongst nodes in a computer network or, more generally, any telecommunications network. Network diagrams are often drawn with software-based drawing tools. The following network diagram example was drawn by using our network diagram tool, although there is nothing stopping you from using simpler tools such as whiteboards. Network diagrams, an example of which is depicted, are commonly used to depict hardware nodes as well as the connections between them. Network diagrams are arguably a high-level form of UML deployment diagram with extensive use of visual stereotypes. Learn complete network diagram guide to get more details. You can easily connect network topology shapes by using smart connectors that can be visually attached to library shapes.